Li Lykke Timotej Zachrisson better known by her stage name Lykke Li is a well known indie pop musician from Sweden, who was raised by artistic parents (her mother was a photographer, her father is a musician). She lived in Portugal for five years and spent winters in Nepal and India. At one point, she worked as a dancer on Swedish TV. Li had her first success with the EP “Little Bit” in 2007. She later released her debut album, Youth Novels, on LL Recordings in the Nordic region on 30 January 2008, prior to a wider European release in June of the same year. The album was produced by Björn Yttling (of Peter Bjorn and John) and Lasse Mårtén. It was released in the United States on 19 August 2008. Her life and her career are relentlessly pulled forward by an impatient desire to see what's just around the corner, her music full of ideas about moving on and breaking free. Just eighteen months ago, she was complaining to her mentor, Bjorn "of Peter and John fame" Yttling, that everything had gone wrong because she was twenty and still hadn't released an album. Now twenty-two, she's finding that things are on track: With the release of her debut album in Sweden through her own label, LL Recordings, in January 2008, she's been surprised and maybe a little embarrassed to find that the world is falling at her feet. She's just the kind of person people can't help falling in love with. The album, entitled Youth Novels, is now scheduled for a well-deserved US release on August 19th, 2008 via her own label, LL Recordings. Recorded with Bjorn over the last 10 months, Youth Novels weaves its way through 14 perfectly-realized chapters. You'll hear harpsichords, flutes, and theremins throughout the album but you'll also hear Lykke Li's magnificently brittle, candy coated vocals. The record is like a well-thumbed paperback which falls open again and again on the same pages: love, loneliness, frustration and obsession - the chronicles of LL's life so far, told with unusual honesty. It includes recent hit "Little Bit" (released on an EP this May), continues with the punchy throb of "I'm Good I'm Gone," whose video is already making waves around the internet, and brilliant songs like reluctant breakup anthem "Breaking It Up," "Let It Fall" and "Hanging High." Throughout, there's a sense of momentum and a pursuit of some unobtainable goal. "I don't think I'll ever be satisfied and calm," Lykke Li admits. "Even now I wonder how I'm going to live a whole lifetime, feeling how I do now..."
If you're wondering where Lykke Li's (first name Lykke Li, last name Zachrisson) fidgety, keep-on-moving attitude began, let's rewind twenty-two years to the very beginning of her nomadic life. We're in northern Europe, and Chernobylised clouds have chosen to dump their radioactive rain down on Stockholm. A new sense of environmental consciousness grips the country and LL's parents - her mother a photographer, her father a musician - move from the city to the country and then, selling everything they own, to Portugal, where they buy land and build a house in a small village in the mountains. As the years tick by, the family moves to Lisbon, then back to Sweden. Every year, the family escapes Sweden's gloomy winters to India, then return in the summer. At nineteen, she ended up in New York City for a few months, performing at open mic nights and pretending to be a Swedish superstar in order to get gigs. By twenty, she was back in Sweden, working with the incredible Bjorn Yttling, on her first collection of songs. Indeed, her passport may be Swedish, but life has shown that Lykke Li is from a little bit of everywhere, with a perfect balance of global city and suburb that pours from the organic, digital feel of her songs. 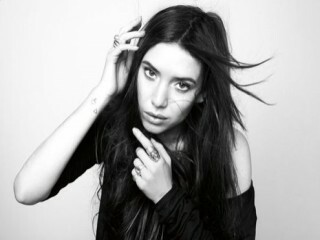 View the full website biography of Lykke Li.